Gold traded slightly lower last night in a range of $1200.50 - $1208. After ticking up to its $1208 high early during Asian time, gold moved down to support in front of $1200 against a firming dollar (DX to 94.73). The DX was boosted by a decline in several emerging market currencies – in particular the Turkish lira (6.40 – 6.834, 2-week low, rumor that central bank deputy governor Kilimci was going to resign), and the Argentine peso (31.50 - 34, asked the IMF for an early release of a $50B loan), and a softening in the euro ($1.1710 - $1.1675, weaker Economic Confidence, Eurozone exposure to Turkey). Mostly weaker global equities were a tailwind for gold with the NIKKEI up 0.1%, the SCI was off 1.1%, European markets were off from 0.2% - 0.6%, and S&P futures were -0.2%. Moderately higher oil prices (WTI from $69.70 - $70.05) were supportive of stocks. At 8:30 AM, reports on US Personal Spending, Jobless Claims, and Personal Consumption Expenditure were as anticipated, but US Personal Income (0.3% vs. exp. 0.4%) missed expectations. S&P futures softened (-6 to 2907), and the US 10-year bond yield slumped to 2.862%. The dollar, however remained fairly firm, as weakness in the euro and emerging market currencies kept the greenback well supported. Gold did move higher, but it was capped at $1207. Later in the morning, news that the Argentine central bank hiked rates again, by 15% to 60% sent the peso tumbling (41.49), which sent other emerging market currencies further down. 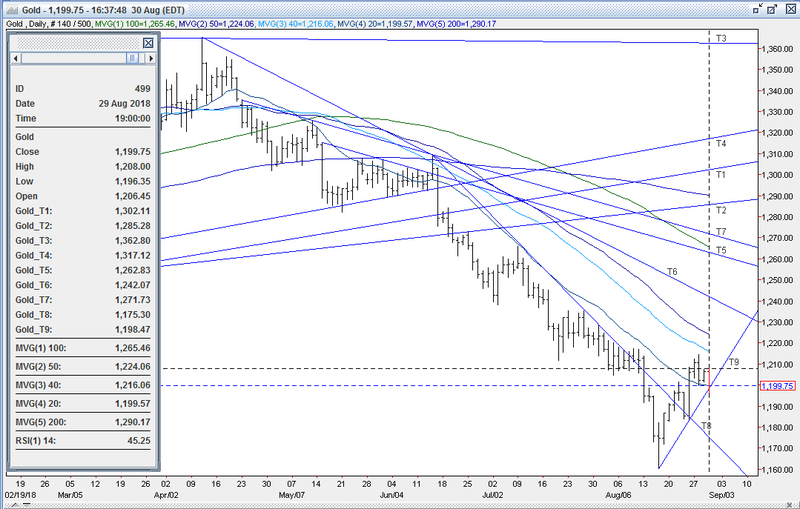 The US dollar shot higher (DX to 94.90), and drove gold lower. The yellow metal tripped sell stops under $1200 (Tuesday’s low, 20-day MA) and $1198 (up trendline from 8/16 $1160 low) to reach $1196.30, with a fair amount of long liquidation seen. However, some bargain hunting buying emerged, and quickly took gold back up to the $1200 area. Into the afternoon, US stocks clawed back to unchanged (S&P to 2912), helped by oil surging to $70.47 (two straight weeks of significant US inventory declines, supply concerns over sanctions on Iran). The US 10-year yield rose to 2.877%, but the DX retreated to 94.74 - pressured by a modest rebound in emerging market currencies. 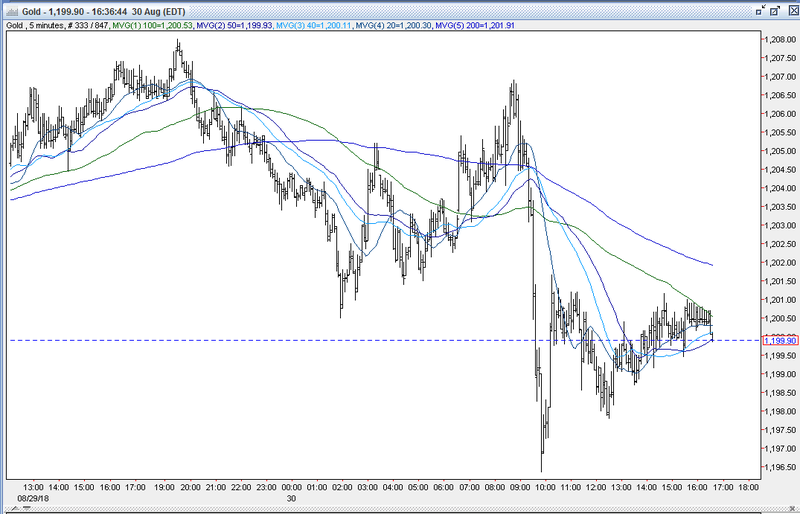 Gold, caught in the cross-currents, hovered between $1198-$1199.50. Later in the afternoon, a report that Trump wanted to move ahead with the $200B in tariffs on Chinese imports next week – after the comment period expires. US stocks plunged (S&P -18 to 2895 before finishing -13 to 2901) with trade sensitive stocks 3M, Boeing and Caterpillar and the materials sector leading the decliners. The 10-year yield sank to 2.855%, and the DX ticked down to 94.70. 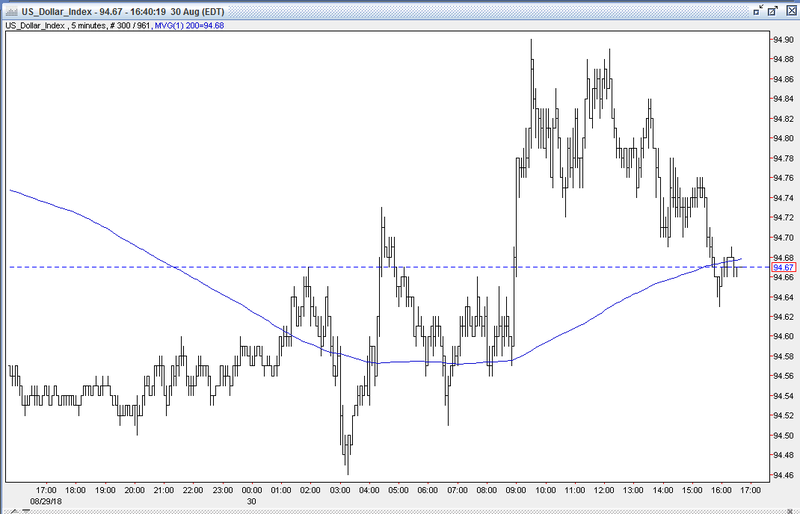 Gold edged higher, trading up to $1201. Gold was $1200 bid at 4PM with a loss of $6. Open interest was off 7.1k contracts, showing a net of short covering from yesterday’s advance. Volume was lower wit 256k contracts trading. While bulls were disappointed with gold’s $6 pullback today, they were encouraged that gold was able to bounce strongly off its lows, that it was able to finish above key support levels $1198 (up trendline from the 8/16 $1160 low) and $1200 – despite the strength in the dollar. Much of the bullish community believes that gold bottomed at $1160 on 8/16 after a $35 2-day capitulation, and are comfortable that the uptrend from that level ($1198) is still intact. Some will look to continue to buy on weakness, and others on some expected ensuing upside momentum. They maintain the market has been and remains extremely oversold - having dropped $205 (15.0%) since the 4/11 $1365 high, and $149 (11.4%) since the $1309 high on 6/14. Bulls strongly believe that the dollar’s rally was badly overextended, and expect its correction from 8/15’s 96.99 high (up 9.90% since its 88.25 low on 2/14) to continue, and drive a significant short covering rally in gold. Bulls are looking for gold to consolidate recent gains over $1192-$1195, and then challenge resistance at $1205-08 (today and yesterday’s,highs, former 9 bottom support – 8/2, 8/3, 8/6, 8/7, 8/8, 8/10 7/7/17, 7/10/17 and 7/11/17 lows), and then$1216-18 (5 tops, 8/6, 8/7, 8/8, 8/9 and 8/10 highs). Beyond this, bulls are looking for a move to at least $1262 – the 50% retracement of the move down from the 4/11 $1365 high to the 8/16 $1160 low. In addition, bulls maintain that last Friday’s Commitment of Traders Report showing the large funds getting further net short (turned short last week for the first time since 2002) and with the massive and growing gross short position (+7k to 222k contracts –short side of gold becoming an extremely crowded trade) leaves this market set up in a highly favorable position to move up from potential heavy short covering and sidelined longs returning to the market. Bears have been using gold’s recent bounce off of $1160 to rebuild short positions scale up, and are comfortable to continue to sell into strength. Other bears, however, are still looking for gold to decline significantly more, as witnessed by last Friday’s COT Report showing another hefty build in fund gross shorts (+7k contracts to 222k contracts). They feel fuel from a rebound in the dollar from its recent correction will provide downside pressure on gold, and that the dollar’s ability to strengthen against other currency majors (and emerging market currencies) still has legs. They will be gunning for stops below $1200, $1195 (up trendline from $1160 low), $1185 (up trendline from 10/19/08 $682 low), $1175 (options strike), $1171-73 (quadruple bottom – 8/15, 8/17, 1/6/17 and 1/9/17 lows), and then the $1160 low from 8/16 to lead to a test of $1150. All markets will continue to focus on geopolitical events (especially emerging markets), developments with the Trump Administration (especially on US-China and US-Canada trade, potential legal issues), oil prices, and will turn to reports tomorrow on Japan’s CPI, Jobless Rate and Industrial Production, China’s PMI, German Retail Sales, Eurozone Unemployment Rate and CPI, US Chicago PMI, University of Michigan Sentiment, Baker Hughes Rig Count, and the Commitment of Traders Report for near-term guidance.